Florence, December, 1965, and the dead body of a loan-shark is found in his apartment, a pair of scissors buried in his neck. Inspector Bordelli, who lives in the same quarter, had been aware of the man's unsavoury reputation and had started to look into his dealings - and being a violent and unpleasant loan-shark, the man's dealings had made him very wealthy. Bordelli had gone so far as to visit an old burglar acquaintance, currently in prison, with a view to asking a favour of him when he gets out; to help Bordelli get into the loan-shark's apartment for a look around. But at the end of the day Bordelli is a homicide detective and it is clear that the man's loan-sharking activities are not his official business - until now that is. The corpse has been lying in the apartment for several days and the place has been ransacked. Bordelli talks to the pathologist, sets the murder investigation in motion and returns home to another night of broken sleep. He wakes up in a panic, heart beating and dreaming of being entrapped in spider webs. Turning the light on, Bordelli starts to think back to his time in the war and to his resistance comrades, many of whom are long dead. With the morning he considers that he needs a holiday but for now it is work as usual. He returns to the dead man's flat and starts a meticulous search. Concealed behind a framed picture he finds a bundle of photos. A beautiful but very young girl is posed provocatively in the photos and on the back of each is written the name "Marisa". Later that day Bordelli calls in to see the pathologist. He too has made a discovery. He has found a gold ring inscribed with the name "Ciro" in the dead man's stomach. Meanwhile Bordelli's young colleague Piras is spending the Christmas month recovering from gunshot injuries at his parents' home in Sardinia. His father was one of Bordelli's fellow resistance fighters and Bordelli enjoys taking the opportunity to ring them asking after Piras and taking the opportunity to chat with his old comrade. But the young officer himself is impatient to get rid of his crutches and to get back to Florence, to his girlfriend and to his police work. With time on his hands, he is drawn into the events surrounding the suicide of a neighbour's cousin which he begins to suspect is not suicide at all. DEATH IN SARDINIA is a crime novel that intertwines Bordelli's ambivalent pursuit of the loan-shark's killer with his younger colleague's search for the truth about a supposed suicide in rural Sardinia; both of these cases draw to their conclusion during the Christmas celebrations in Florence and Sardinia respectively. 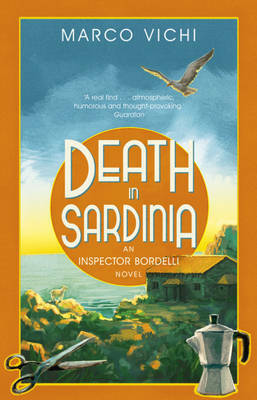 DEATH IN SARDINIA is the third in Marco Vichi's "Inspector Bordelli" series to be published in the UK; it has been translated into English by Stephen Sartarelli who also translates Andrea Camilleri's "Inspector Montalbano" books. I will say at this point that although I have only read one or two of the popular Camilleri books they do not quite hit the right note for me. I know that I am out on a limb here so I ask Montalbano fans to forgive me when I say that I enjoyed Vichi's DEATH IN SARDINIA more. I found an extra richness in the character of Bordelli, a single man in his fifties who looks back on his experiences during Mussolini's fascist regime and his experiences fighting in a partisan brigade after Mussolini's defeat, whilst also observing life in 1960s Florence: the young men with long hair who listen to the Rolling Stones, ride their scooters and smoke dope. Let me add that with Bordelli's world view and his friendships with ex-burglars and "working girls", indeed his relationship to the rule of law, not all of these observations are critical. As in Camilleri's books there is plenty of food to be described, eaten and enjoyed: Bordelli's lunchtime visits to a friend's restaurant kitchen, Piras' mother's Sardinian dishes and, last but not least, a splendid Christmas feast cooked up by Bordelli's burglar friend. But alongside all of this delicious food I greatly savoured the darkly humane subtleties of Bordelli's world in DEATH IN SARDINIA. With a fourth in the series, DEATH IN FLORENCE, due out in the UK in 2013, let's look forward to reading more Marco Vichi and his Inspector Bordelli stories. Read another review of DEATH IN SARDINIA. Lynn blogs at Little Grey Doll.